Burgers are the quintessential all-American grilling favorite. Nothing beats biting into a juicy burger with all the fixings. But when it's dry and under seasoned, it can be a disappointment. Just how do you get the perfect burger? It starts with the right kind of beef. Most grilling experts will recommend a high grade chuck beef that's about 80% lean and 20% fat. However, you can still get a juicy burger using a 90% lean and 10% fat ratio, all while saving about 90 calories and 10 grams of fat. The juiciness really depends on how you cook it. Start by mixing salt, pepper and if desired, garlic powder, into the raw beef. Using clean hands is generally the easiest and non-destructive method. In terms of a good burger, size does matter. Taking a bite of nothing but bun is not very satisfying. Because the burger will slightly shrink when cooked, the patty should be at least as wide as the bun and about 1-inch thick. A perfectly cooked burger is slightly crusty on the outside and moist on the inside. To achieve this, preheat your grill to a medium high heat and sear the burger 1-2 minutes on both sides to develop a crust. Then, move it to the upper grill grate of a gas grill or outside edges of a charcoal grill and close the lid to let it continue cooking at a slower rate, locking in the juice and flavor. Whatever you do, don't press down on the burger or all that juice that you've worked so hard to keep will seep out! Cook the burger to an internal temperature of no less than 160?F. A delicious burger is more than just the meat; the bun and toppings are also important. Whether you go with a Kaiser roll, potato roll, or a regular hamburger bun the taste and texture is best when lightly toasted on the grill. Simply split the bun open, place cut side down, and grill until lightly golden brown, about 15 seconds on a medium high heat grill. No added butter or oil is needed. Common toppings include lettuce (crisp Romaine is best), tomato, and onion. Avocados, pickles and sauce, such as light mayo, ketchup or mustard may also add flavor. 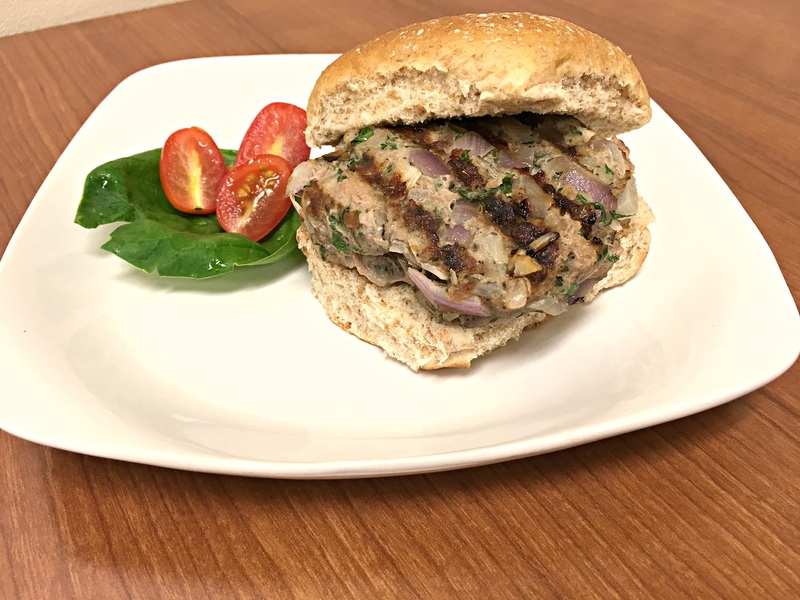 You can also try keeping a lean burger moist and flavorful by mixing in diced onions or peeled and diced eggplant, which soaks up the fat (flavor). This especially works well when using ground turkey. Check out the flavorful recipe below! With these tips your lean burger will be far from dry and boring. Mix all the ingredients together in a bowl and form 6 patties. Wash your hands and refrigerate burgers until ready for cooking. Grill patties on medium heat for 7 minutes each side, or until burger reaches internal temperature of 165°F. Add any toppings of tomato, leaf lettuce, cheese or sliced avocado to your liking.